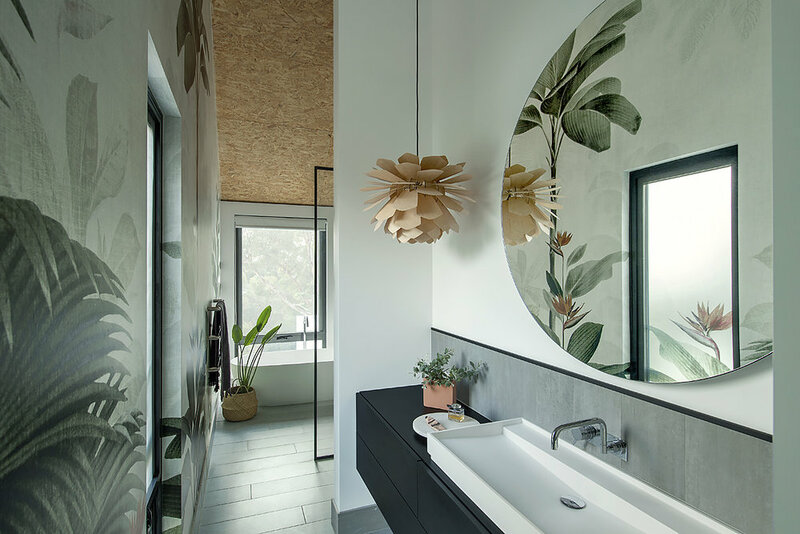 The clients were conscious about the use of the space; they wanted to create an open bathroom that could feel like a retreat. Colour palette: We kept the palette light, with Dulux’sWhite on White for the walls. This allowed the wallpaper to be the main injection of colour in the room, while grey tiles were used as a backdrop. Materials palette: Oriented strand-board cladding was chosen for the ceiling. It was left exposed in order to bring more texture to the upper-floor rooms. This sets the tone for the colour palette, being earthy with botanical elements, and timber continues to be represented in the pendant light. The wallpaper was also carried over one of the windows, not only to provide continuity of pattern but to act as a privacy screen from the street. Key pieces of furniture/fittings: The wallpaper was from a local supplier, Origin Wallpapers. The light was from Woolights. Separating the wet area with the shower and bath by a glass screen creates an open feel and allows the light to filter easily through the room. Also, positioning the bath next to the window lets the clients enjoy beautiful shimmering city light at night. Arranging the space so it feels big and open within a narrow floor plan. The height of the room gave us lots of volume, which makes the room feel bigger and not as confined. The space also feels great to be in and brings a feeling of serenity into the room that is then carried into the adjacent master bedroom, which is layered with textures and continues the same colour palette. What do you love about this beautiful bathroom? Tell us in the Comments below. And don’t forget to save your favourite images, like and save this story, and join the conversation.